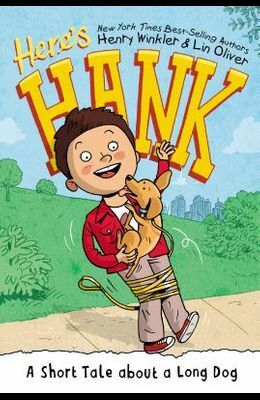 Here's Hank stars the same Hank as in the bestselling Hank Zipzer series, only this time he's in 2nd grade Hank is a kid who doesn't try to be funny, but he somehow always makes the kids in his class laugh. He's pretty bad at memorizing stuff, and spelling is his worst subject. (But so are math and reading ) In the second book in this new series, Hank has finally persuaded his dad to get the family a dog, and Hank couldn't be more excited Mesmerized by a little wiener dog chasing his tail (making him look like a Cheerio) at the animal shelter, Hank declares him to be the new Zipzer dog. But when Cheerio gets loose in the park, Mr. Zipzer furiously announces that the dog must go. Can Hank convince his father that he wasn't the one who let Cheerio off his leash, or will he really lose his new pet and best friend?